From organising a day at the mall for orphaned children, to giving out essential-items kits to construction workers, Dubai’s biggest developers are embracing Ramadan with clever initiatives that are bringing together communities and giving back to society. At Al Barari, two large fridges are installed at convenient locations where residents can drop off food and drinks and construction workers can collect them. One fridge has been placed next to The Farm, the community’s restaurant and social hub, and the other next to a mosque. The initiative is part of the Ramadan Sharing Fridges project, which is under the patronage of the Islamic Affairs and Charitable Activities Department and Emirates Red Crescent. The campaign started in 2016 and saw more than 190 fridges set up this year throughout Dubai. The areas covered include Garhoud, Mirdif, Silicon Oasis, Sports City, Barsha, Emirates Living, Umm Suqeim, all the way to Dubai Marina, Palm Jumeirah, Jebel Ali and Dubai Investments Park. “We have a lot of workers on-site because of the construction and the gardens as well. There are special timings when they come together to share the food. People are generous in the community and the fridges are always full,” Mustafa Ratlami, Al Barari community manager, tells Property Weekly. Emaar, the UAE’s biggest listed real estate developer, has put together around 10,000 packs, which contain essentials such as soap, shampoo and cap, for distribution throughout the developer’s communities and project sites during Ramadan. “This simple gesture goes a long way for the people who work tirelessly to build our society,” says Ahmad Al Matrooshi, managing director of Emaar Properties, which has also been organising other campaigns for its workers. 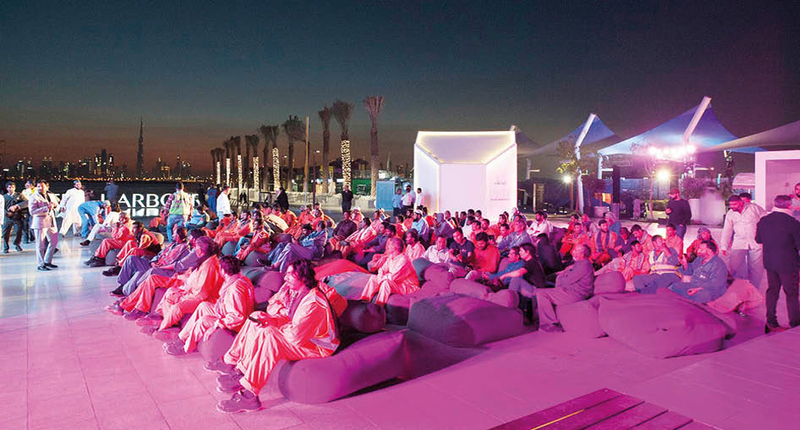 In March, it hosted more than 2,000 workers at weekly evenings of entertainment and food with activities such as karaoke and open-air movie screenings at Rise Dubai Creek Harbour. Meanwhile, Nakheel’s Ibn Battuta Mall expects to welcome more than 200 orphaned children throughout the holy month for fun-filled days of shopping, entertainment and dining. Meraas’ “Gift a Smile” campaign, on the other hand, encourages residents to donate books, toys and clothes at locations such as City Walk, The Beach, Boxpark, Last Exit Al Khawaneej, The Outlet Village, Al Seef and La Mer. “We have a unique opportunity to build a society of happy and healthy people in the UAE, and we are fortunate to have the support of a nation in our quest,” says Othman Al Madani, director of happiness, National Programme for Happiness and Positivity.